It was 6 months after the 2014 mid term elections, and things had changed in Washington. The GOP now had a 70% majority in both houses of congress, and immediately following the announcement of impeachment hearings, President Obama had resigned, and was last seen boarding a commercial flight with Valerie Jarrett, Reggie Love, and a handful of key players, headed for Guam. Guam had recently been granted sovereign nation status, and upon his arrival there Obama assumed the role of Emperor. Michelle had of course been installed as the new Empress, although she ruled in absentia from one of her many overseas palaces. During her coronation, she remarked that for the first time in her adult life, she was "proud of Guam". Guam had just finished completion of a new royal airport, in the exact center of the island nation, at the insistence of former congressman Hank Johnson, located so that the island would not tip over. Mr Johnson had joined Obama in his new endeavor, and had been installed as the Minister of Guam Not Tipping Over And Capsizing. The United Nations had announced their intention to relocate their headquarters to Guam, and Mr Johnson had begun planning the construction of the magnificent new structure, to be situated in the center of Obamopolis, right next to the Emperor's palace. Rahm Emanuel had also accompanied Mr Obama, and had been installed as the Minister of The Interior, And Of Having Safe Streets. Mr Emanuel's days were very busy searching for guns and attending to the daily affairs of state, as Emperor Obama was frequently absent on apology tours for the new nation, and at home in the new capitol city of Obamopolis, implementing his new program of "Let's Move Change and Hope Forward". John Kerry and Hillary became the newly named Minister of Wartime Heroes and Minister of Blaming Stuff on Stupid Videos, respectively. Janet Napolitano had also joined the new Emperor, and was given the title of Minister of Bogarting Ammunition And Protecting Obamopolis From Military Veteran Zombie Terrorists. President Joe awakened in the gray Washington dawn. He spent about an hour looking for his shoes and experimenting in the mirror with different ways of combing his hair, and walked downstairs to the cafeteria, past the throngs of tour groups, and saw that his usual seat, in the corner by the slurpee machine, was occupied by a group of tourists. He sat down next to them. "Hi folks, I'm Joe. I'm the President." " 'Sup Joe. Bob and Suzy, and these are the twins, Timmy and Pete. We're from Topeka." Little Timmy flicked something at Joe, and got a stern look from the Secret Service, hovering nearby. 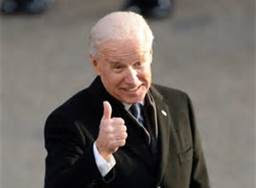 Joe had his usual breakfast, chocolate pudding and a pop tart, said a couple of nice things to the tourists, and headed for the briefing room for his daily look-see at how the country was doing. Right after the elections, the first thing that happened after the abolition of the Fed, the EPA, and the DOE, the restructuring of the IRS, the DOJ, and the USPS was the complete abolition of Obamacare. Eric Holder had disappeared. The trial had only taken about a week, and he had been sentenced to public service in lieu of prison, and was assigned the task of going to Mexico and retrieving all those weapons from the drug cartels. He had failed to show on the first day, and no one had seen him since. The Keystone pipeline was well under way, the price of crude had dropped nearly $75 a barrel, and the Saudis were now apologizing to us. After Mr Obama's departure, the private sector had exploded in a fury of activity, federal tax revenues had skyrocketed as a result, the unemployment rate had fallen by half and was headed lower, and public sector unions had vanished, along with the union bosses and the pension funds. The size of the federal government's workforce had been cut by 70%, and the concept of the government working for the People, instead of the other way around, had returned. Private R&D had returned in full force, General Motors had announced plans to return it's operations to the US, and the health care industry was once again regarded as the finest in the world. The forces guarding the nations borders had been quadrupled, and federal aid to Guam had gone up 900%, due to the sudden inexplicable collapse of the new nation's economy. In spite of these new expenditures, the huge increase in available revenue was breathtaking. Kids were actually learning things in school. The constitution once again meant what it said, and was once again respected as the law of the land. The free world once again recognized America as the "shining city on a hill', a force to be emulated. A renaissance was under way in America. In the face of all this, President Joe had very little work to do running the ship of state. As was his normal practice, after breakfast and the 15 minute briefing, he walked across the street to his customary spot on the mall, and spent the morning in his Slim Whitman liederhosen, tap dancing and offering impromptu yodeling lessons to passersby. At ten o'clock sharp, a Secret Service agent arrived and said "Mr President, it's time for your pudding break, and your nap". President Joe then retired to his quarters, and after his four hour nap, emerged once again, to the stirring sounds of "Hail to the Chief", to carry on his duties until suppertime. Mac and cheese and fish sticks. And pudding. After dinner Joe went back upstairs. He sat quietly, watching the sun set over the Potomac. It's been a pretty good day, he thought. It was good to be President. Sounds like a good future. first the brown tree snake, then hank johnson now the obama administration. the poor Guamanian can't catch a break.